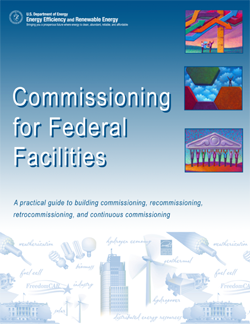 Provide an introduction to commissioning approaches to a variety of professionals involved with the management, op-eration, and maintenance of Federal buildings. Illustrate case histories, including cautionary lessons learned. Provide guidance on commissioning best practices. Demonstrate how commissioning can help Federal facility managers meet energy efficiency goals and LEED certifica-tion requirements. Demonstrate how commissioning can be integrated in facil-ity management and O&M programs to make those programs more efficient and effective. Demonstrate how different types of commissioning (such as retrocommissioning and continuous commissioning) can be incorporated into a variety of building types and applications, above and beyond the most commonly understood commis-sioning approaches.